Firefighters have been dealing with a blaze on moorland in West Yorkshire. 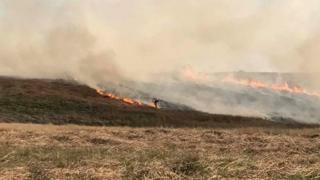 Crews were called to Ilkley Moor, near Bradford, shortly after 18:30 BST to tackle the fire which could be "seen for some distance", West Yorkshire Fire and Rescue Service said. By 21:00 BST, the blaze had been contained to an area of about 100m by 200m (330ft by 650ft), crew manager Gary Overend said, with officers using beaters to extinguish the flames.